After the bleating of the sheep has lulled to a comfortable chewing, the dogs and I take a walk just as the sun begins to climb its way into the blue sky. This morning routine serves both to exercise dogs after a long cold night, and allow them to re- fortify the perimeter with a wall of urine. Make no mistake, this ritual is more than a simple walk. Great detail is paid to reading the events of the night before. This is the Canine Facebook. Winter is here and the coyotes are becoming bold enough to be seen in the daytime away from the ranch. 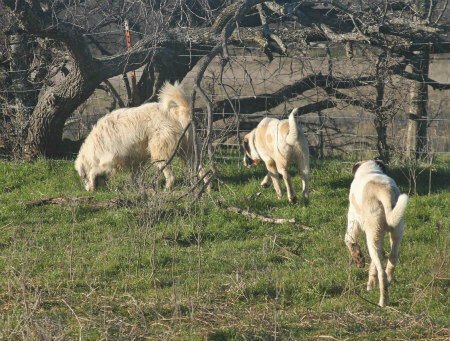 The regular bleating of sheep and goats is sure to lure in empty bellies hoping for an easy meal. 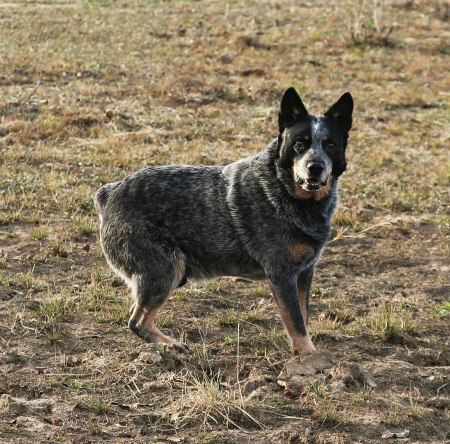 Each morning we not only walk the boundaries of the sheep pasture, but we expand our wall of urine and scratch marks deeper into enemy territory where coyote and cougar have been free to prowl. We tag their wall with our own urine graffiti. A new pack is in town. They're wearing sheep bells and they have teeth, and they want the predators to know it. 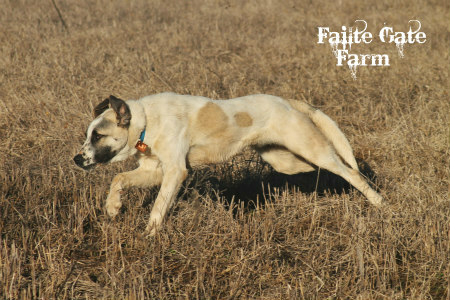 With the sheep still munching in the barn, this is a time for the dogs to hunt and to play games which keep them in peak physical condition. 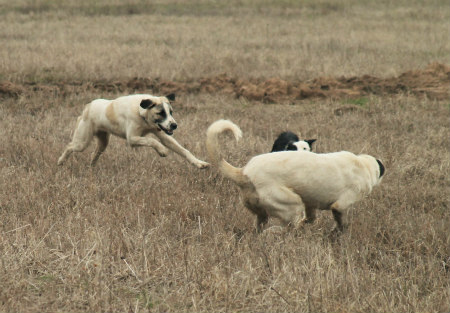 They sharpen their skills on each other, and tag team the Border Collie in a frightening shadow of a kill. We end our walk to return back to kennels for a raw breakfast of chicken or beef - the bounty after the hunt. I watch an entire chicken leg quarter disappear with a few casual crunches and marvel at the power of jaws that arguably belong to a Elementary School Student. 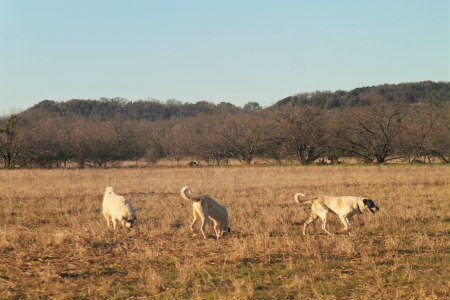 It is easy to forget the Anatolians are only 7 months old, as they are bigger than the other dogs, and are already earning their keep as Livestock Guardian Dogs. If there is ever any doubt about whether these dogs are necessary, one need only look to the ground. The proof is in the tracks lurking below the house. 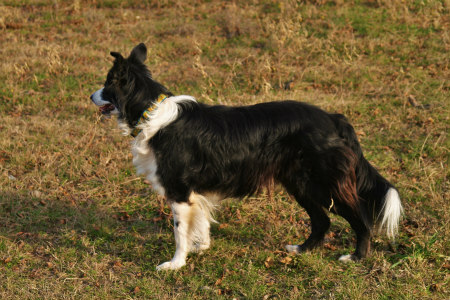 I'm a city slicker and I'm curious, why do the dogs wear sheep bells? 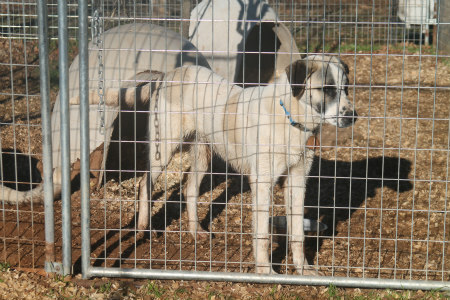 More great info for my rescue group that now has an Anatolian branch. Keep the great writing up it is my morning papers. Briar has a big fan in Florida, too. Awwwwww.... That Big White Dog has quite a fan base, but Other Half is not one of them. He hates her hair and her beard. That's my favorite part!!! Nice post. I find comfort in that you are doing with your dogs what I am with mine early between feeding the masses and milking. 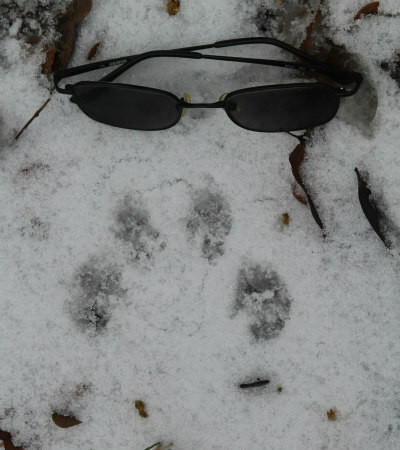 Hope reality never brings more than paw prints in the snow.